While every shape in a diagram should be noticed, cherished and nurtured, some elements of a diagram should be completely ignored by Visio’s dynamic connectors. This article discusses how to make shapes “unglue-able”. Visio’s user-interface has settings to “mostly” do this, but there is one nagging issue that is arguably a bug. When a connector is duplicated via Ctrl + Dragging, it will still glue to a shape, despite setting the various “don’t glue to” settings (steps 1 and 2 below). To workaround this bug, step 3 below must be done in the ShapeSheet. This works-around the issue where Ctrl + Drag duplicates of connectors from glue to shapes despite the proper settings. For the rest of you, the full story follows below! The classic example that I run into a lot when doing work for customers is the title block and frame situation. Customers need special, company-specific frames and title blocks, which I create for them. Many have fancy behaviors, such as snapping to the bounds of the page, showing the drawing scale automatically, in a standard format, elements that stay the correct size no matter what page the scale is at–the list goes on. At any rate, they’ve got frames around the page, and title blocks with lots of elements on one or two sides of the drawing. If the customer is creating any kind of connected diagram, such as the one above, and these shapes are going to be inside a frame or near the title block, then I have to take special care to set up these shapes so that connectors can’t glue to them. If you just draw a frame and title block, and perhaps group them together into a single shape, things will go wrong quickly. A default shape–drawn with the drawing tools on the Home tab–will accept an incoming connector. So now you’ve got this frame shape that encompasses nearly the entire drawing page. No matter where the connector goes, it will try to snap and glue to the frame. Note: the frame in this example has No Fill, but nonetheless, Visio sees it as a target for gluing connectors. Now, if you’re accurate enough with the mouse to find connection points on the I/O ports, then you will be OK. But if you need a free-standing connector–say it is a work-in-progress and doesn’t have a target port yet–then you’re out of luck. Also, the frame will flash green (or red in older versions of Visio) as you move the Connector tool around the page. This will likely drive you insane. Document has pages with different sizes and orientations, so separate background pages are needed for each size-orientation pair. Title block information is page-specific, so blocks need to be on the target pages. Different page types might use different standard title blocks and borders. Foreground page information doesn’t always show through from background pages. You can insert smart text fields on background pages, for example page number. The number will update independently for each foreground page that uses the background page. But for more complicated fields that involve ShapeSheet calculations–such as drawing scale–the foreground page updating fails. Select your frame or title block or both. Make sure the Developer tab is showing. Your shapes will now, for the most part, be ignored by connectors. The first problem involves gluing to subshapes. 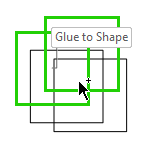 If your to-be-ignored shape or shapes have subshapes, then the Connector tool will find them and try to glue to them. You’ll notice the green highlighting as you move the mouse about. Voila! Your shapes will no longer be targeted by the Connector tool. And connecting your other shapes will be much easier, and a lot less distracting. Ok, walk back on the stage, and pick the microphone back up! You can draw an unattached connector. You can leave one and free, and glue the other to a port’s connection point. You don’t have all that annoying highlighting/flashing as you move the Connector tool cursor over title block elements and over the frame. Life is good. What could go wrong? Duplicated by holding down the Ctrl key as you left-click-drag that shape. This only occurs when you specifically Ctrl + Drag a copy of a connector. While that doesn’t sound so bad, it can be really, really strange if you are zoomed in. The connector that you allegedly just drag-duplicated will disappear before your eyes! You’ll have to zoom out to find it, and even then, it might just be a single point, if both ends happen to glue to the center of the frame! I have found that one more setting will fix this last problem. You have to go into the ShapeSheet to do it, but it’s not hard. Since you’ve already activated the Developer tab, you can now right-click your shape, and choose Show ShapeSheet. As you scroll down through the ShapeSheet, notice that in the Miscellaneous section, the cell ObjType has been set to 4. This was done when you set the “Do not lay out or route around” setting earlier. The last, missing setting is only available via the ShapeSheet, and has yet to be set. Approximately 9 sections below Group Properties, you’ll find Glue Info. In this section, we need to set GlueType to 8, or visGlueTypeNoWalkingTo. Once you’ve done this, your title block and frame group will be fully, 100% connector-proof! Ensure that Miscellaneous, Group Properties and Glue Info are all checked. The main reason I wrote this post is because I keep forgetting what that final setting is (I think I’ve written it down in OneNote, but I still have a hard time finding it via search…) So I figured I would create an article, then I’d know where to look! I’ve also rolled it into one of the utility add-ins that I use for my own development. If you’re a coder, here’s a snippet that will make a selection of shapes “truly-no-glue to”. It’s a bit disheartening to look at after all the explanation in this article. It boils down to three settings, which you can set via the ShapeSheet, which can be automated in precious little code! // Uncheck: "Snap to member shapes"
Good god, thank you for this. The snapping to the group thing was killing me. Is it possible to create a new line (shape) that does not glue or snap and add it to the insert ribbon so it can be used when needed and not have to deal with all these settings just to draw a straight line? You could just use the line tool. There’s a tool drop-down at Home > Tools. Right-click the line too and choose “Add to Quick Access Toolbar” to put it at the top of the window. The line tool draws straight lines. They will glue to connection points on shapes and glue to guides, but they won’t go crazy and try to route around stuff like the Dynamic connector does. You can hold down Shift while drawing/editing a line to constrain it to horizontal, vertical or 45-degree diagonal. I have tried to use this approach on the Wall Shape (Walls, Doors & Windows Stencil). When I snap walls together as a “T” joint the walls are glued together, when the walls are joined as a corner they only snap together (they do not glue together). Is there a way to turn of the dynamic glue connection point for wall shapes (T joints) but still allow them to snap together.